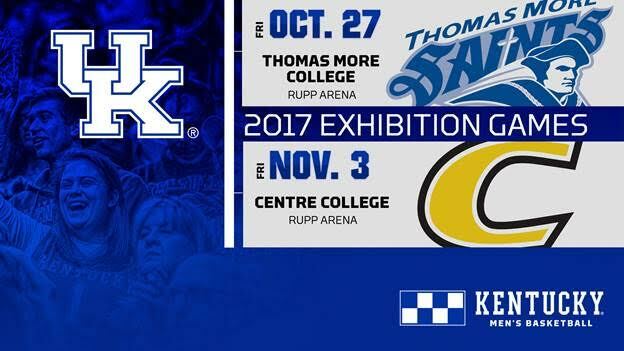 LEXINGTON, Ky. – In keeping with recent tradition to play at least one university in the state of Kentucky in the preseason, the Kentucky men’s basketball team will face two in-state schools in Thomas More College and Centre College for the 2017-18 exhibition slate. The Wildcats will meet Thomas More on Oct. 27 and Centre on Nov. 3. 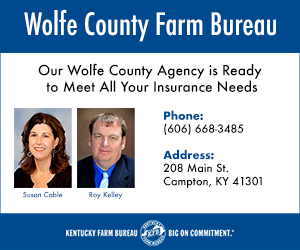 Both games will be in Rupp Arena. Times and TV designations will be announced at a later time. The announcement of UK’s two exhibition games completes the list of opponents for the Wildcats for the 2017-18 season. The nonconference schedule, which features 12 teams that played in the postseason and eight that appeared in the NCAA Tournament a year ago, was announced in June. Kentucky’s SEC opponents for the upcoming season were also announced, although dates have not been released at this time. Both meetings will mark exhibition firsts for Kentucky, although the Wildcats frequently played Centre in the early 1900s. UK owns an all-time record of 25-19 vs. the Colonels (Centre consolidated with Central University in 1912), but the two schools haven’t met since Feb. 13, 1929. 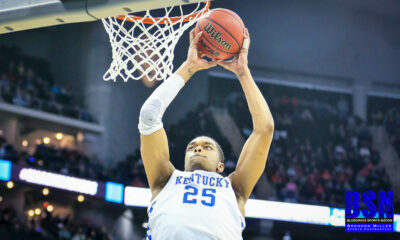 Kentucky has never played Thomas More in an exhibition or a regular-season game. 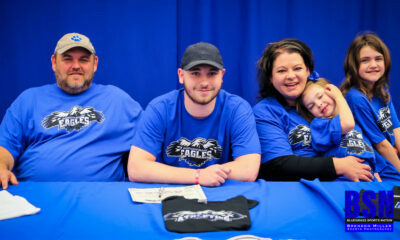 Thomas More went 22-7 last season and won the Presidents’ Athletic Conference. The Saints lost in the first round of the Division III NCAA Tournament. All five starters are expected to return from that team. Centre, also a member of Division III, went 14-11 in 2016-17 and finished in second place in the Southern Athletic Association. Centre, then known as Central University, owns the distinction of handing Kentucky its largest defeat in school history – an 87-17 loss on Jan. 28, 1910. Cawood Ledford, Kentucky’s legendary radio play-by-play announcer from 1953-92 and UK Athletics Hall of Famer, attended Centre College. Also, Will Barton, UK’s current director of basketball administration, played for Centre in 2008-09, when the Colonels went 23-5 and advanced to the NCAA Tournament. UK’s season will tip off with Big Blue Madness on Oct. 13 in Rupp Arena. Long considered the official start of the Kentucky basketball season, this year’s grand show will once again take place on a Friday night. The Blue-White Game is slated for a week later, on Oct. 20, in Rupp Arena. The Wildcats will officially open the regular season vs. Utah Valley on Nov. 10. The completed dates and opponents of Kentucky’s schedule to this point can be found under the schedule tab at ukathletics.com. For the latest on the Kentucky men’s basketball team, follow @KentuckyMBB on Twitter, Facebook, Instagram, Snapchat and on the web at UKathletics.com.